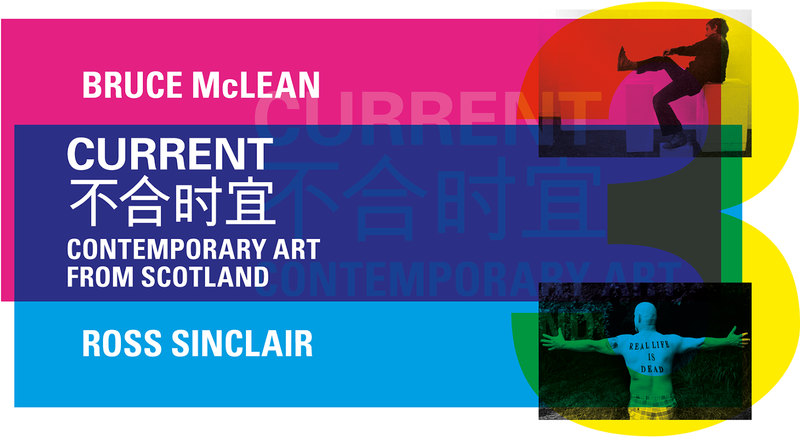 This is the exhibition identity I have designed for Current: Contemporary Art from Scotland at the Shanghai Himalayas Museum in China. 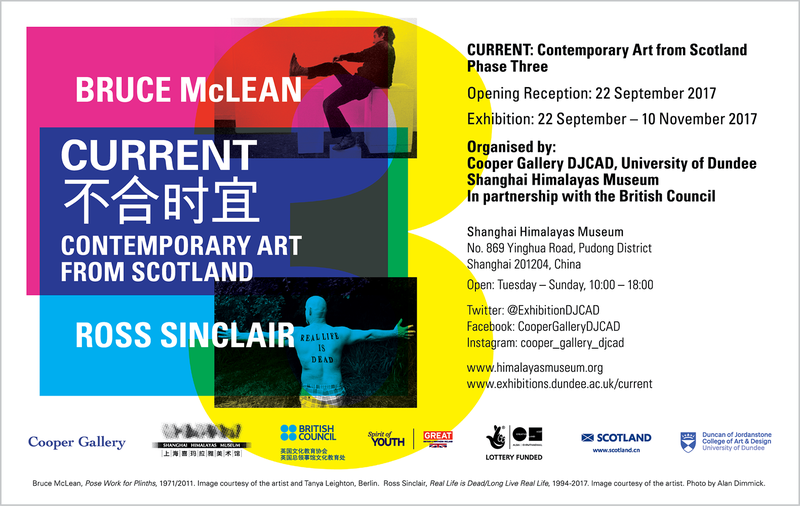 Curated by Cooper Gallery, Duncan of Jordanstone College of Art and Design, University of Dundee in the UK in collaboration with Shanghai Himalayas Museum and organised in partnership with the British Council, Current: Contemporary Art from Scotland is a four-phase contemporary art exhibition programme, showcasing for the first time in China the distinctiveness of contemporary art made in Scotland. 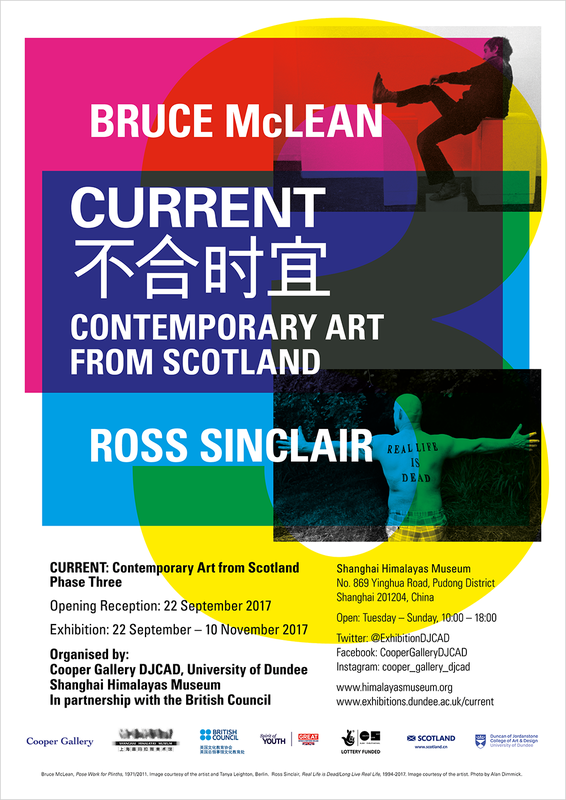 Current Phase Three comprises of two solo exhibitions from Bruce McLean and Ross Sinclair. 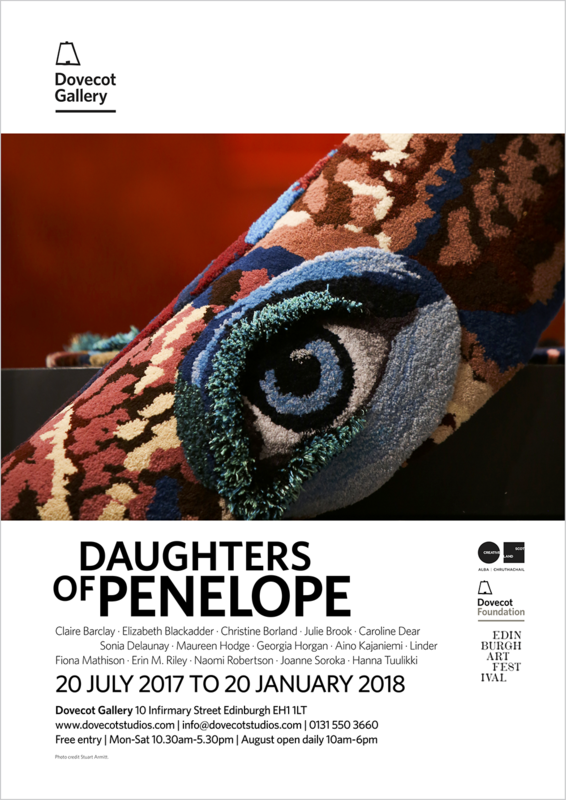 The exhibition runs from 22 September to 10 November 2017. The brief stated that the design ‘should reflect the concepts of Current, and the work of the two artists featured in the solo exhibition; and could also reflect the exchange of ideas and knowledge between art from Scotland and China. Cooper Gallery and Shanghai Himalayas Museum are looking for a fresh and elegant design, that has a distinct and innovative graphic and/or incorporates both artists’ work’. Before starting the design I had a meeting with the team at Cooper Gallery where we discussed - amongst other things - collage: I presented the idea of layering the artists’ work, creating overlaps that reflect the dialogue between the pratices of the two artists - from different generations, but both displaying a grass-roots spirit and an engagement with the social and political dimensions of art and culture. The curators at Cooper Gallery were keen on this idea so I went away and started working on some drafts. From a selection of images sent by the gallery, I chose one image of Bruce McLean’s work and one from Ross Sinclair that seemed to be good representations of each artist’s practice and the work showing in Current. I increased the contrast on these images so that they became purely black and white with no midtones, taking on a punky, DIY photocopied feel which I felt suited the aesthetic of both artists. I then devised a series of transparent shapes of colours found in each of the artists’ work, and layered these to create new colours on the overlaps. I made several iterations of this coloured background, refining the colours and shapes, until I was happy with the result. I then added the black and white images of the artists’ work, moving the images around until the composition started to come together. Finally, I added the text of the artists’ names and the exhibition title (including the Chinese translation) along with a large yellow ‘3’ which tied together all the elements of the design (and created further new colours). I presented several variations of this idea to the galleries and the artists for their approval; after some tweaks, we arrived at a graphic that everyone was happy with. The design brief had three elements: the first was a poster design (top) that would be printed in various sizes and included the exhibition dates, venue, opening hours as well as the usual logofest; the second was a digital image (above) that would be used on the Cooper Gallery website that only included the basic information of exhibition title and artists’ names (this is my favourite version: the format did not suit the square design of the exhibition graphic so I added an extra element of transparent text that repeated the exhibition title - it’s possibly the Chinese characters that make this design so interesting); the third element was an advert (below) that appeared in the September issue of Frieze magazine. I supplied open files to the design team in Shanghai where they used the elements of my design to create new graphics.